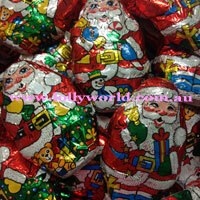 Chocolate Santas are made with superfine milk chocolate by Pink Lady here in Australia. These 20g chocolates are in a foil wrap with bright pictures of Santa. A solid chocolate they are also delicious and will add an elegant touch to your Christmas occasion. Use for table decorations, Christmas Day treat or stocking fillers. May contain peanuts and tree nuts.